Ira Glass, I love you. I was talking to my friend, Meredith, the other day and she said something that was so beautiful and true that it took my breath away. She was saying that she is trying to use the word “and” a lot more when she describes aspects of herself because that word allows her to acknowledge and appreciate her complexities and the varied dimensions of herself. “And” is so inclusive and it speaks to the depth and the complexity of the human personality … I wish I had recorded that phone conversation with her. She said expressed this so perfectly that my heart ached in that “this American Life” sort of way. 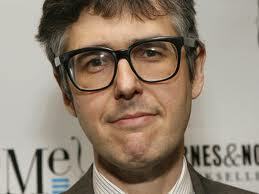 Ira Glass and the other great people who create “this American Life” each week, do this “and” thing really well. They are able to tell a story about a guy and even when that guy has done something crazy or kind of awful, by the end of the story, you can see how he got there, why he made the decisions he did and you feel for him. You feel him. If you are me, you are usually listening on Sunday morning on the way to dance and you have to pull over to cry a little bit because you know how complex and yet how simple we human beings are. The story, whichever it happens to be, is so human that it stirs up compassion and empathy and these primal things that we all experience: love and the need for love, fear, a dark side to ourselves, our childhood…and you just might see yourself in that guy. Because you can relate to who he is and how he got into his predicament, it’s not judgment that you feel, it’s compassion. When we are asked in a yoga class to observe the breath and not to judge it, or when we are invited to notice the feelings and the stories that we tell ourselves when we can or can’t do a challenging pose, what would happen if we pretended to be Ira Glass or Meredith? The old me might say, “Last month, I could do this pose, but now I eat lots of cake and I don’t practice as often.(uuuugh! )” The new me with Meredith-Ira enhancement could close my eyes, use that pleasant and inquisitive Ira Glass tone of voice and instead said, “I used to be able to do this pose and now… now I eat lots of cake and I don’t practice as often. (quiet pause)” Doesn’t it change the whole thing? Doesn’t it seem like maybe I am more interesting for my eating of chocolate cake and don’t you wonder what it is that I do with my time now that I practice less often? The “and” allows for the beautiful complexity of who I am. With Ira Glass and Meredith, I can see that I am a person worthy of a 10 minute slot on an excellent radio program because there is way more going on with me than just not getting into a pose anymore. I have a life that is rich and full and interesting and I am on the verge of discovering even more about myself because there is another “and” and another independent clause just waiting to be tacked onto that sentence. I might not be able to rock bakasana today. So what? And, I enjoy eating chocolate cake. You got that right. And lately, my yoga practice doesn’t look much like yoga at all. It looks a little more like sleeping in. ah-hem. There are a whole bunch of experiences, qualities and neuroses that make me who I am and if you heard my very own story narrated by Ira Glass and edited with perfect music and that hollow empty space of sound behind his crisp and honest voice, you’d probably feel something in me that is in you and you might even have to pull over and cry a little bit. This little word “and,” as Meredith says, is such a good one to use when talking about yourself. It allows for so much. Next > Oh yeah? Say that to my face. Your other friend Meredith thinks this is absolutely wonderful. We need to learn all of our ways, I think, to understand the “and” of us. I love me some Merediths! This piece made me pull over and cry a little bit (metaphorically; I don’t read and drive). It’s so beautiful and just what Sunday night needed to hear!